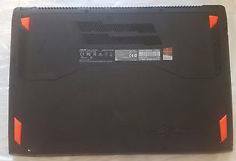 This ASUS ROG GL502VS-DB71 has GTX 10 graphic card series, the NVIDIA GeForce GTX 1070 graphics which is really good for a laptop, 2.60 GHz Intel Core i7 6700HQ up to 3.5GHz,16 GB of RAM, but expandable to 32 GB with its 2 slots. The hard drive is a SSD, a 256 GB M.2 NVMe SSD , a 1TB 7200RPM Hard drive storage, a 15-­inch non-glossy screen which is G­-SYNC panel that decreases screen stutter, lagging or other problems while you are gaming. Appearance wise, the ASUS GL502VS looks powerful. What I mean, when you have it out of the box for the first time, you will likely think, it is a 17 inch range laptop, but it is a 15.6″ powerful laptop. It is approximately one inch in thickness, and about 5-6 pounds. It is heavy but has super power for gaming to go. The whole laptop is also thinner than older gaming laptops available. ASUS ROG GL502VS is built from plastic material, but not all, the outer lid is aluminum, and the inside has aluminum texture and look. The back panel has RoG logo in reddish color. There are 4 rubber stands under the laptop to keep it steady and always stay in place while playing. If you really want to keep it nice, I’d get a sleeve when you are on the go. The operating system is Windows 10, I am get used to it, so it is to me, a good OS, very snappy due to the device’s SSD, and responsive, things works super fast. There are about 10 screws to remove the back panel, and there are 2 slots of RAM inside, one slot is where the 16 GB factory memory located, and the other one is empty, so that you can expand the memory up to 32GB. For the SSD, the slot will work with a m.2 PCIe not the SATA. If you are a gamer, having a 16GB RAM is a minimal, and to have a possibility to upgrade your memory is a plus. On the left side, there are, 1x ethernet port, 1x power port, 1x mini display port, 1x HDMI 2.0 for 4k screen, 1x USB 3.0, and 1x USB 3.1 type C gen 2 that can speed up data transfer to 10 Gbps. There fans to cool are located almost everywhere on the laptop, on the back, under the device, and in both sides. With intensive use, the fan noise is still decently quiet, I was surprisingly impressed. The temperature was quiet good too. I did ASUS ROG GL502VS test or benchmarked it with Total War: Warhammer’s, got 66 fps at ultra setting 1080p, did not notice any throttling temperatures. Need I say more? On the right side, there is an audio port (Headphone/Microphone Combo), 2x USB 3.0 ports, SD card slot, and a Kensington lock. The ASUS ROG GL502VS keys are nicely spaced, and have good solid feels, the touchpad is a large one. 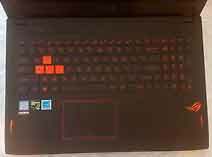 The chiclet keyboard keys has very contrast black and red color, although, to me, it seems to be orange, the backlight is red colored and adjustable. The important 4 keys, the WASD, have orange colors on the whole keys, as these are important keys for gamers. The 1080p full-HD 60Hz screen is fantastic! Clear, matte (non-glossy), and IPS with G-Sync quality. Read this if you want to disable the G-Sync feature, it can be enabled or disabled. The viewing angle is very good, and it does not have reflection when you want to game outside – with full brightness. Overall I am happy with this ASUS ROG GL502VS-DB71, it is possibly the most affordable gaming laptop (found best price here) with GTX 1070 and Gsync screen you can possibly get.